Bright, richly sweet. Lime blossom, raspberry jam, sandalwood, roasted cacao nib, maple syrup in aroma and cup. Sweetly tart in structure with juicy acidity; viscous, buoyant mouthfeel. The finish leads with citrus and berry notes in the short, segueing to sandalwood-framed sweet florals in the long. Produced entirely from trees of the Kurume and Welicho varieties of Arabica at Suke Quto farm. Processed by the honey method, which means that the outer skin of the coffee fruit is removed, as it is in the wet or “washed” process, but at least some of the sticky fruit residue is allowed to dry on the bean and later removed by machine along with the parchment skin. This coffee is both organic- and Rainforest Alliance-certified. Paradise Roasters specializes in micro-lot Arabica and Robusta coffees from Asia and other emerging origins. The company prides itself on quality and freshness, craft-roasting coffees in small batches only after orders are placed. Visit www.paradiseroasters.com or call 763-433-0626 for more information. 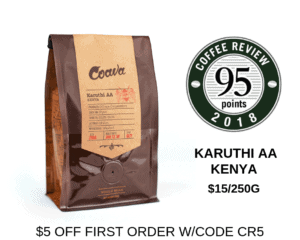 The Bottom Line: This honey-processed Ethiopia is a citrus and berry chorus, from lime blossom in the aroma to raspberry jam in the cup, backed by continuous suggestions of sandalwood and crisp cacao nib.